Mitsubishi Chemical Advanced Materials conferred the coveted international «Mitsubishi Chemical Advanced Materials Award» for the fourth time on Saturday, January 22, 2011. This scientific award with a first prize of EUR 15 000 was won by the Japanese researcher Dr. Tadashi Kajiya, who wrote his thesis at The University of Tokyo, Japan. The second prize of EUR 7 000 went to the Swiss scientist Dr. Norman Lüchinger, from the Swiss Federal Institute of Technology Zurich (ETH Zurich), Switzerland. The winner of the third prize of EUR 3 000 was Dr. Michelle Seitz, USA, at Northwestern University, USA. Our warmest congratulations to the award-winners and thanks to all applicants for their entries. You will find more information on the Mitsubishi Chemical Advanced Materials Award 2011 and the assessments of academic jury in our press release. 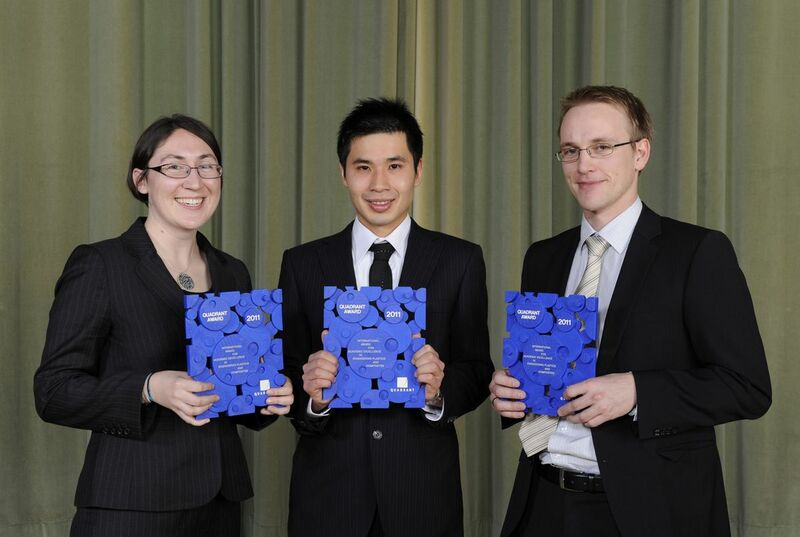 The winners of the Quadrant Award 2011 (left to right): Dr. Michelle Seitz (3rd prize), Northwestern University, USA; Dr. Tadashi Kajiya (1st prize), The University of Tokyo, Japan; Dr. Norman Lüchinger (2nd prize), ETH Zurich, Switzerland.